The roses are fabulous | carpe diem! As a child in western Canada ‘rose’ could have been one of two things. 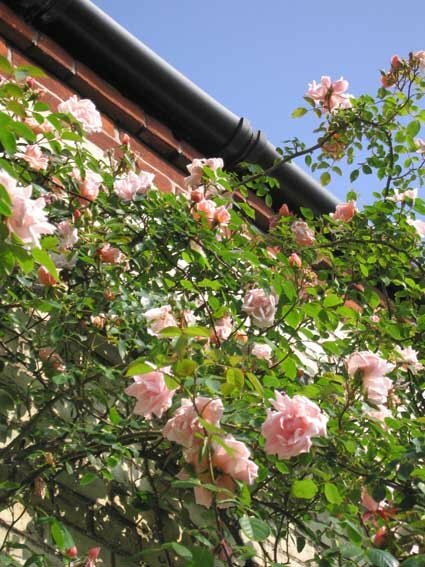 Given that the references in literature were to things in gardens, it seemed likely that ‘rose’ was the leggy, spined hybrid teas that sprouted in regimental lines in the parched soil lining our neighbour’s paths. Blooms too big for their stems, in strident pink, orange, red or combinations of all three, leaves yellowing in the hot dry summer sun. I couldn’t understand why anyone would bother to grow them, let alone write paeans to praise that insignificant scent. The alternative was our provincial flower, the wild rose, which lined the roadsides and trapped our clothing when we played in the woods. It was so abundant that we scarcely noticed it or the faint scent of its fragile pale pink blooms unless by chance we found a corner where sun and wind conspired to concentrate and trap the perfume until it became something that could almost leave you drunken with pleasure. The scent of wild roses, sweet clover and dust from roads or wheatfields… all bring back my childhood. We arrived in the UK and I continued to see no reason for roses. My first garden was a tiny blank canvas (the previous owner, a Sicilian, had grown nothing but courgettes and one giant grapevine) on which I painted a lawn, pond, hostas (oh, happy slugs) and an assortment of herbaceous perennials. No roses. Everyone else had hybrid teas: why bother? Until, desperate to entertain the in-laws, we visited the Royal National Rose Garden in St Albans – and I realised what a rose was. Now roses are what I have in our garden. It’s a small garden by North American standards, about 30′ square, and some of that is patio and some is vegetable patch. There are roses everywhere else, and at this time of year when the (hated) privet hedge, house and fence trap summer in the garden, the scent is heavenly. Albertine (above) was one of the first to arrive and now, 18 years old, it usually covers the front of the house in salmon-pink and vicious thorns. The smell fills the house and drifts of petals block the front door. It’s still a bit sparse this year after being cut to the bone two years ago. 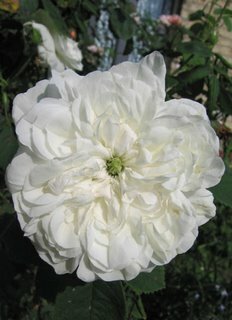 Mme Hardy (above left) is my favourite, white with a green eye. Beside that (as in life) is Teasing Georgia, a modern David Austin rose. 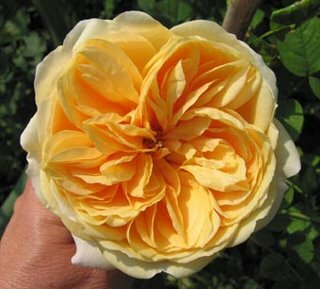 Not with the strong, sweet perfume of the true old roses, but as it and the next two, Ludlow Castle and Pegasus (shades of yellow and cream, not illustrated) flower all summer, I’m not complaining. Much. In another bed is William Lobb. Look hard and you’ll see the resinous ‘moss’ that gives the ‘moss roses’ their name covering the flower buds. 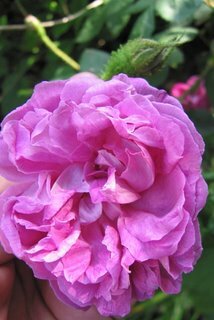 Next to that (below, in this case) is ‘Mary Rose’, an Austin with an old rose perfume, but not repeat-flowering. 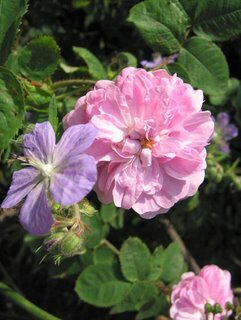 Shown here with Mrs Kendall Clark (the geranium, silly). There are more that I haven’t photographed. Guinee, with deepest dark red blooms and an amazing perfume is persevering up the fence despite hot sun and competition from tree roots. Two more whose names escape me are running riot through the field maple and the pear tree, with a honeysuckle in hot pursuit. And then there’s Maiden’s Blush growing from an old plant up and out through that privet hedge. Passers-by who catch the merest hint of that scent pivot on their heels and bury their noses in the pale rose-pink blooms. Last summer the roses were also fabulous. At their peak I spent an entire morning harvesting blossoms, snipping away the white at the base of the petals before following an Elizabethan recipe to make rose-petal conserve. The petals of 80 flowers (I counted) and sugar metamorphosed from something that looked like wet dishrags (but smelt divine) to 4 tiny pots of amethyst that when, opened, released the essence of my summer garden on the bleakest of winter days. I will make it again, but not this year. This entry was posted in Uncategorized on June 18, 2006 by sarahw. Your roses are beautiful. I inherited (somehow) a love of roses from father-in-law, who has a huge garden filled with roses. But these are in formal rose beds – not quite my thing, but still beautiful in a restrained way.For how long would you say you have the benefit of the flowers? I’m so sad when they don’t last long (I only have about 8 different roses and don’t know much about them, despite the books I have). 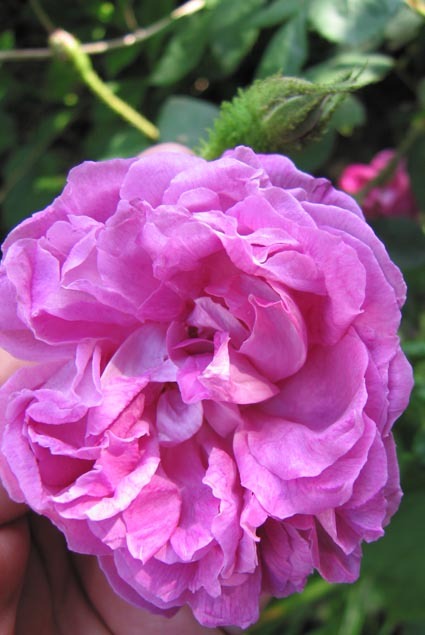 I love the scent of the bourbon rose, zephirine drouhin.You must enjoy the evenings, wandering around looking at the flowers’ beautiful colours and drinking in the evening scent. I know what you mean. I like a garden which is just on the edge of running riot… climbers on the verge of strangling trees, a wave of Nigella crashing through strands of Gladiolus byzantinus, with the artichokes standing proudly behind a seething mass of giant catnip and irises. I just wish the bindweed didn’t like it too.The ‘old roses’ that flower once each year are at their peak for about 7-10 days (depends on the weather), although there are early and late ones. I love zephirine too; any of the old classic rose scents. If I were taller and more languid I’d try to find one to wear, but most I’ve tried are too ‘sweet’ or something. We both had to work last Saturday; late afternoon/early evening was spent sitting out in the garden with a bottle of wine, an assortment of nibbles and knitting/books, enveloped by the scent of roses with an occasional hint of dianthus from the sunny border. It doesn’t last long, but I try to engrave these days in memory to see me through the less pleasant ones that are bound to follow. I can smell the roses from here! Thanks for sharing them with me, as our roses are pretty much done until later this fall…we often get two or three blooms a year when it isn’t so hot. Have you tried Eau des 4 Reines by L’Occitane? It’s sweet but light. I usually prefer a muskier, more earthy scent, but this is lovely for summer.By the way, I find your writing just beautiful to read. You really have a lovely way of painting a picture. Oh, thank you, Alice! I’ll try the perfume… and the compliment is lovely 🙂 I’ve enjoyed reading all my life (I can’t remember learning to read), especially the way that our minds translate words on the page into pictures and smells inside our heads. I think it’s fascinating.